Alabama Bill of Sale of Boat / Vessel is a legal document for facilitating a sale/purchase transaction of a boat or vessel sold with warranty. The seller undertakes to protect the rights of ownership of the buyer by signing this bill of sale form. Notarization of this legal instrument before the notary public of Alabama State is necessary for its execution. Both the seller and the buyer must sign this legal document before the notary public. You may choose to enclose a copy of the inspection report of the boat or vessel by a certified professional. Provide all details about the financial transactions and boat or vessel descriptions accurately. 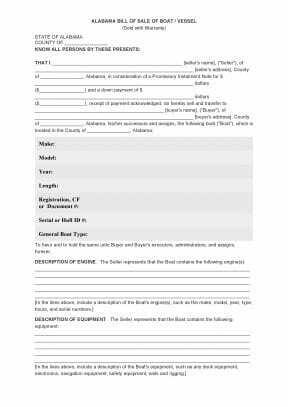 This Boat Bill of Sale form has six prominent sections and completing all of them duly is very necessary. Provide details of the boat accurately. You may mention additional terms of sale if any, in the space reserved for the same. Mention the make, model, year of manufacturing, type, hours, and serial numbers of the engine/s in this space. You may provide descriptive information about the engine/s. This space is reserved for mentioning descriptions of equipment/s fitted on the boat / vessel. You may choose to provide a detailed description of deck equipment, sails and rigging equipment, electronic equipment, safety equipment, and navigation equipment in this space. Select the option between yes or no for the inspection of the boat / vessel by a certified professional and enclosing the copy of the same. Provide any known defects in the boat on the following lines. 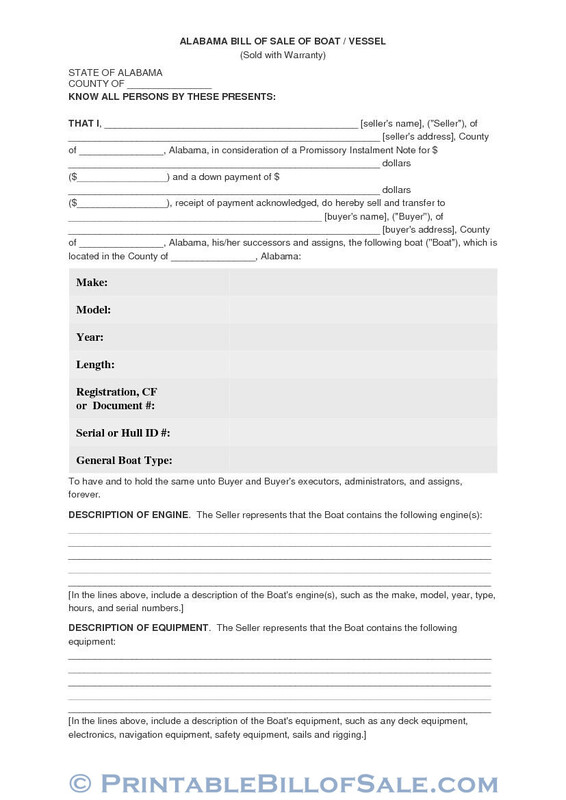 Mention additional terms of sale if any, and proceed to signing the Alabama Bill Of Sale Of Boat / Vessel Form. Both the Seller and the Buyer must sign before the notary public and insert printed name after the signature. The last space is reserved for the notarization of the signature of the Notary Public of Alabama State. 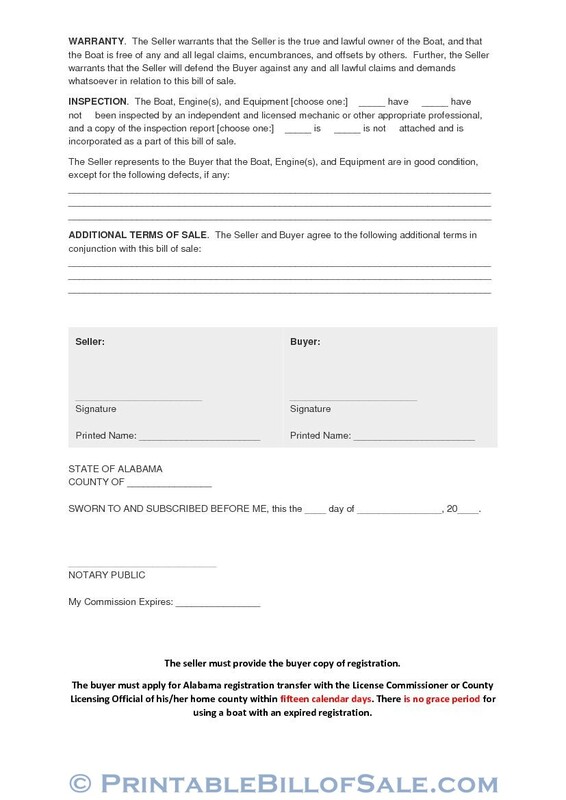 The buyer must transfer the registration of the boat or vessel described in the Alabama Bill of Sale of Boat / Vessel within 15 calendar days of purchase with the License Commissioner or County Licensing Official of his/her county. Grace period for using the boat with expired registration is not available.